Seiden & Kaufman was founded in 1988 when, after working several years together at another personal injury law firm, Steven J. Seiden and Richard G. Kaufman decided it was time to form their own firm. When Seiden & Kaufman began, Steven J. Seiden and Richard G. Kaufman had already earned reputations as conscientious, tenacious, and highly effective advocates for their clients. Seiden & Kaufman’s client base grew at a rapid pace as word spread quickly about its impressive results and personalized representation. The attorneys at Seiden & Kaufman always appreciate the expression of trust, respect, and confidence when former clients repeatedly refer their friends, neighbors, and family members to Seiden & Kaufman. We also consider it the highest compliment when other plaintiffs’ attorneys, insurance company defense attorneys, insurance company claim representatives, and members of the judiciary refer clients to our office. Many law firms come and go. But after a quarter of a century of practicing exclusively personal injury law combined with the endless stream of client referrals, Seiden & Kaufman’s foundation is stronger than it has ever been. Today, having represented thousands of satisfied clients and having recovered millions of dollars in verdicts, arbitration awards, and settlements, Seiden & Kaufman remains a premier personal injury law firm with a widely recognized ability to obtain optimal results. Seiden & Kaufman is not a “volume” practice. We are more concerned with the quality than the quantity of our cases. Consequently, we are able to fulfill our commitment to provide exceptional personalized attention to each of our clients. With Seiden & Kaufman in your corner, you can have the utmost confidence in achieving a successful outcome. We are known for our extraordinary results, deep unwavering commitment to clients, and strong reputation in the legal community. Individuals and families who come to us have had their lives disrupted and are understandably concerned about their future. From the very first phone call, we begin to guide our clients through the legal, personal, and financial maze that they will inevitably encounter. We will work tirelessly on your behalf toward a successful resolution. While many of our cases are resolved before trial, unfortunately some insurance carriers routinely undervalue claims. We leave no stone unturned and thoroughly investigate and prepare every case for trial. If you are not offered full compensation, we will strongly recommend proceeding to trial. The best-credentialed experts will testify on your behalf, well-crafted exhibits will be offered into evidence, and a jury will tell the insurance carrier the total amount of your damages. Seiden & Kaufman has a frequent presence in the New York State Supreme Court in the Bronx, Brooklyn, Manhattan, Queens, Staten Island, Nassau, Suffolk, and Westchester Counties. 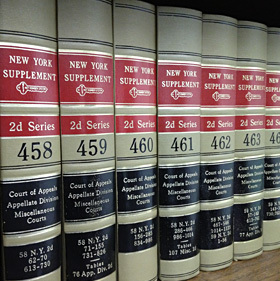 We are also regularly present in the New York State Court of Claims, and the Eastern and Southern Districts of the United States District Courts. Please give Seiden & Kaufman a call for your free consultation. Steven J. Seiden or Richard G. Kaufman will answer all of your questions without any obligation. © 1988 to 2019 | Seiden & Kaufman Attorneys at Law. All Rights Reserved.